Add some brilliant color to your landscape by planting some of our Top Quality Caladium Bulbs!! These gorgeous red caladiums will do just that!! 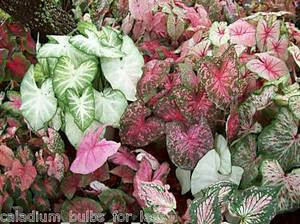 **Disclaimer*** Picture is only a representation of what the caladiums look like. You may recieve varieties that may or may not be shown in the picture.